Pacific Hydraulics is proud to offer a range of the Damcos hydraulic linear and rotary actuators, in either single-acting or double-acting configurations. The Damcos range of single-acting (BRCF range) and double-acting (BRC range) rotary actuators feature a 90° quarter-turn rotation and helicon spline, a rugged construction and compact size. The Damcos rotary actuators are also capable of producing high torque, in the ranges of 125Nm to 32,000Nm for the double-acting BRCF actuators, and 30Nm to 4,800Nm for the single-acting BRC actuators. The single-acting BRCF range also features a spring fail-safe design for added security. The Damcos KC range of double-acting linear actuators comes with a direct position indicator, no external moving parts for compactness and simplicity, and boats a torque outputs in the range of 17,000Nm all the way to 290,000Nm. The Damcos KF/KFR range offers a lighter-duty, single-acting alternative to the powerful KC range of actuators. Featuring a spring-closing emergency fail-safe, the KF/KFR range is capable of torque in the range of 1,500Nm to 16,500Nm. Damcos Actuators are well regarded in the marine sector, and indeed are engineered specifically for that market, though they have broader applications. Their actuators are known for their reliability, compact size and minimal maintenance requirements, well suited to the most demanding conditions, from high vibration to severe environments. 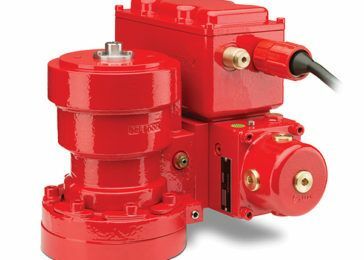 Pacific Hydraulics can source hydraulic actuators from a range of brands, call us today on 1800 786 511 to find out how we can source the right actuator for your requirements.